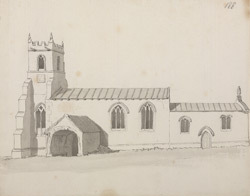 White's Directory of 1853 notes: "The church, dedicated to St Giles, is an ancient fabric, with a chancel and tower, in which are three bells. It was re-pewed, and the north aisle rebuilt about 9 years ago, at a cost of £300." Much of the church was built in the Perpendicular Gothic style. The Gothic style (12th-16th centuries) is characterised by strong vertical lines, high vaulted ceilings, pointed window and door openings and buttressed walls, and falls between the Romanesque and Renaissance periods. Gothic Perpendicular (1375-1540) is further marked by the use of horizontal and perpendicular lines.